The finest wines, cheeses, chocolates, and more gourmet confections and gifts, from the Wine Country Gift Baskets catalog. Wine Country Gift Baskets - The Wine Country Gift Baskets catalog offers the best gourmet gift baskets from the leading vineyards nestled in the heart of wine country, delivered right to your recipient's doorstep. Whether they're a purveyor of oaky whites or bold reds, whether they have a sweet tooth or are satisfied by everything savory, you'll find the best selection online of value-priced, handcrafted gift baskets and handsome gift towers that will suit any palate and any budget. Shop by Occasion - No matter what the occasion is, you'll find a grandiose selection of gift baskets to help celebrate the big day, with wine country gifts for any and every occasion on your calendar. From Christmas and kosher themed gift baskets for the holidays to bountiful Birthday and Anniversary gift baskets, Congratulatory gifts to Get Well combos, you'll have access to the best gourmet gift baskets and gift options to commemorate any celebratory event or season. Shop by Gift Type - Whether you're in need of distinctive corporate gift baskets for business, a romantic basket for your beloved, or a friendly everyday occasion bundle reserved for friends and family, you are guaranteed to find dozens of unique gift basket assortments filled with all of the spirits and edibles that they love the most. Discover elegant wine gifts from the finest wineries including La Crema, Cakebread Cellars, Rodney Strong, Sterling, Robert Mondavi, Silver Oak and others, as well as gourmet gift baskets exclusively for chocolate lovers, champagne connoisseurs, coffee and tea drinkers, cookie cravers, fruit fanatics, spa goers, and even more gifts that will suit their specific tastes and flavor profiles. 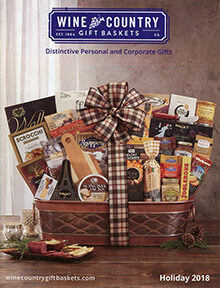 Shop by Price - Wine Country Gift Baskets makes it possible to send an extravagant gift without spending a small fortune. Shop conveniently by price point from a wide selection of gift options for big spenders, middle of the roaders, and budget shoppers alike. Splurge on a big-ticket basket with deluxe Dom Perignon, Sky's the Limit and V.I.P. wine country gifts, or explore perfectly priced goodies and festive budget-friendly baskets that are under $25, but will still make them feel like a million bucks. Satisfy every recipient on your gift list, while expressing the perfect sentiment with fine wine country gifts that will always leave a lasting impression, only from the Wine Country Gift Baskets catalog.